Paul & Jill's Horseback Riding Stables, Inc.
Our hobby, our Tropical fruit orchard, has turned into a tourist attraction of its own. 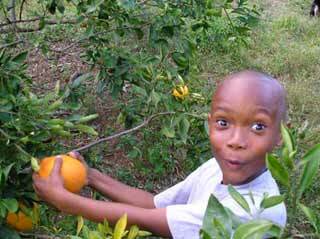 You may never have seen or heard of some of our exotic fruits! Many of the fruit bruise easily or are too perishable to market because of their short shelf life. Thus, many of these delicious fruits are unprofitable to export off island and therefore never reach your supermarket. Before or after the ride, you may sample the various tropical fruit from our display table, and stroll the exotic fruit orchard to see how and where they grow, on trees or vines. By irrigating our orchard, we can manipulate the fruit cycle to produce more frequent crops. Mango trees, a popular fruit, are one of the exceptions, as they need a dry spell before irrigation. Mango season is generally May through July. Yet, we have some hybrid mangos that produce as early as March in dry years. Passion Fruit and Star Fruit ("Carambola") are available almost year round. 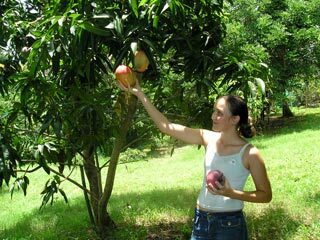 When in abundance, customers may freely take with them some of their favorite fruits, with the exception of mangos (a commercial crop). In March, the Tamarind tree produces thousands of seed pods; the inner pulp is tart and tangy; a spice used in "A1" Steak Sauce and Worcestershire Sauce. Enjoy the fragrance of the citrus tree blossoms in March and April. From Nov. thru Mar. the citrus fruit arrive: grapefruit, limes, lemons, tangerines, tangelo, red Navel orange, Page orange, Washington orange and the sour Wild orange used for juice and jelly. 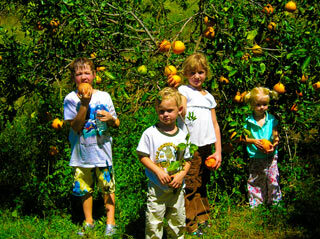 March begins Julie mango season; In April the Palmer and Tommy Atkins variety ripen. In May, the Kidney and wild mangos of the Rain forest begin to ripen, and drop from the trees in abundance, through July. In May through July the Malay apple tree produces bright red skinned pear shaped fruits which have the texture of an apple/pear with a hint of a rose fragrance. 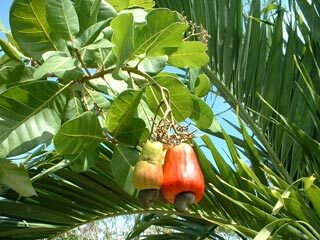 The Cashew Nut Tree produces an astringent apple type fruit with a Cashew nut hanging below. The apple-like fruit of the Cashew Nut comes in yellow or red varieties. May - June produce Cherries; our tropical varieties are Acerola (natural vitamin C source), and Surinam or Brazil cherries. The main crop of Guavas arrive in September, then a lesser crop in December and again in March.